Includes unlimited axe throwing, $40 axe throwing gift cert for future visit, and complimentary arcade game & pool play. BYO Food and Drinks (no hard alcohol allowed, beer & wine only). You can order food and get delivered or bring in. 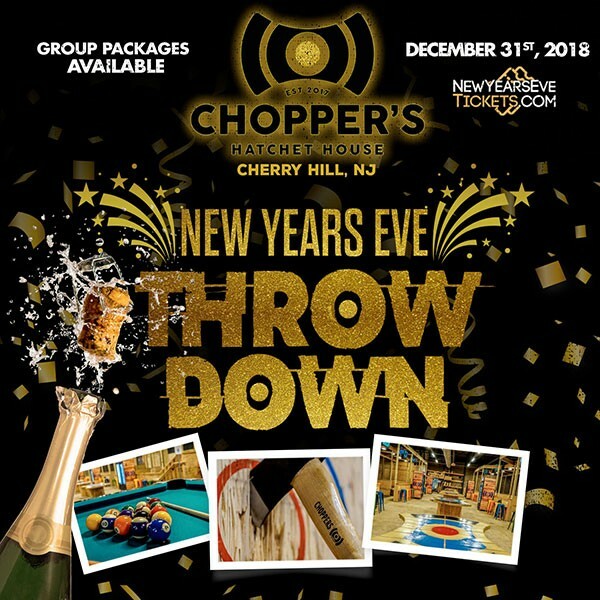 Ticket sales ended at: 12/31/2018 at 9:00 PM $39.95 Ended 18! Includes admission with your own private axe throwing arena (includes 2 lanes / targets) all night long, unlimited axe throwing, $80 axe throwing gift cert for future visit, keepsake axe, and complimentary arcade game & pool play. BYO Food and Drinks (no hard alcohol allowed, beer & wine only). You can order food and get delivered or bring in. Limited to 6 arenas only. You can add on to your group by purchasing the Add On ticket. MAX 15 people per arena.